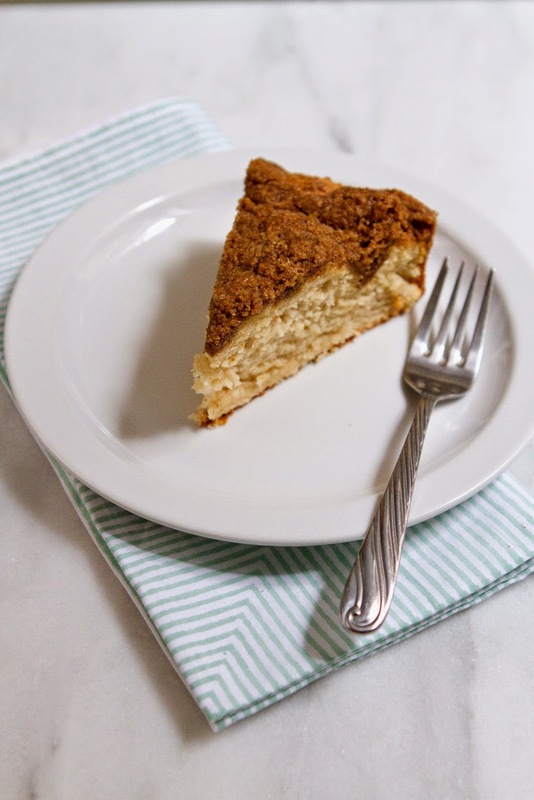 Coffee cake is a wonderful dish. 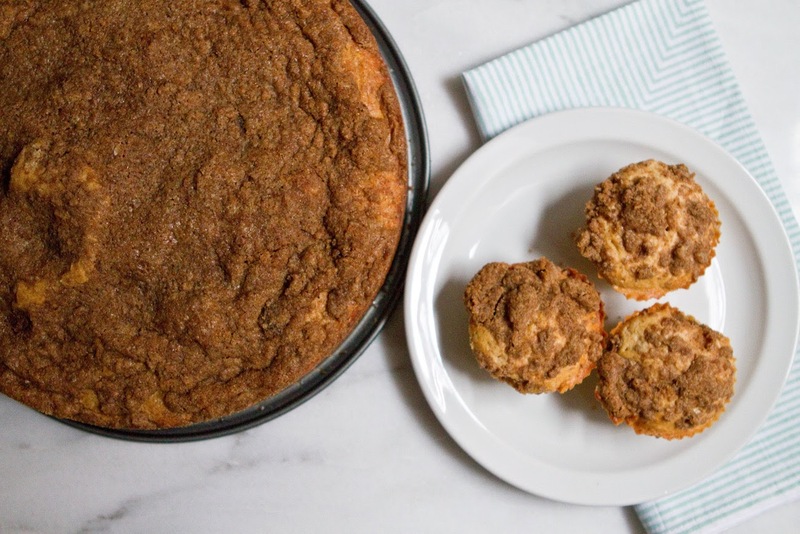 It's basically dessert for breakfast, which I can always get behind, and it involves streusel topping, which is certainly one of the great wonders of the world. 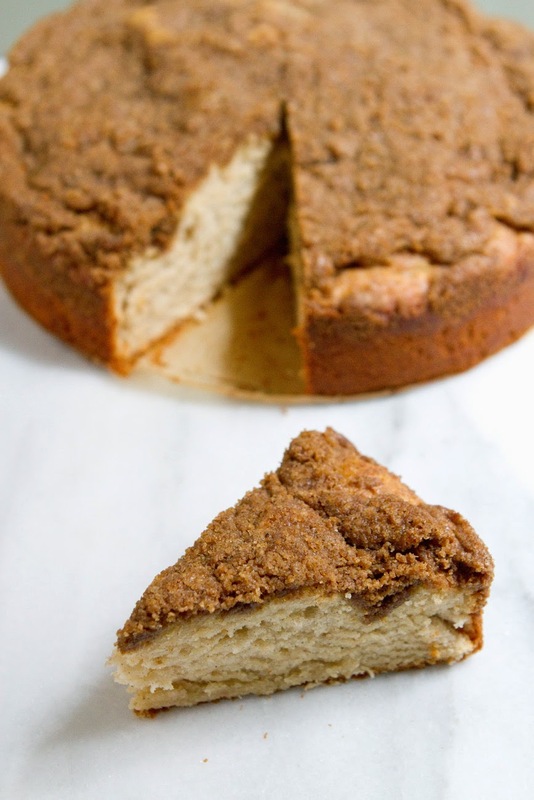 I decided to mix it up a bit with this coffee cake, so I cut back on the amount of cinnamon and added cardamom instead. Cardamom is one of my favorite spices. I discovered it when I got into making my own Chai blends in college. It hails from India, Pakistan, and Nepal- all chai making countries, and has a spiced, deep flavor similar to cinnamon or ginger, but also entirely it's own. Though powerful in flavor I wouldn't call cardamom spicy, unlike cinnamon or ginger too much won't give you a bit of a mouth searing. I was getting over a nasty virus, hence the lack of posts last week, so I decided to take a bit of an easy way out, and I slightly modified a Pioneer Woman recipe for this cake base. I knew this would be a safe option because I have never tried a Ree Drummond recipe I did not like! 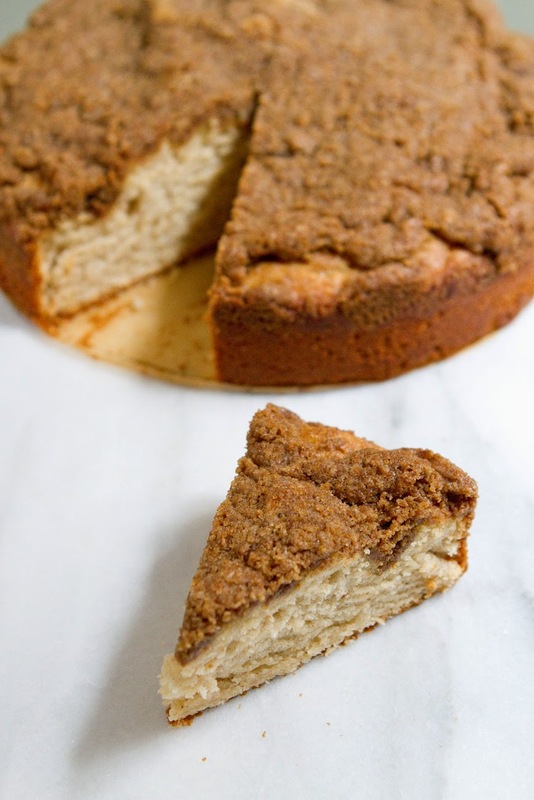 I cut back on the sugar, and added cinnamon and cardamom to the cake base because I love spices in the coffee cake itself, not just in the topping. What I didn't do was cut back on the quantity, even though I know every Pioneer Woman recipe produces enough food to feed an army. Seriously, sometimes S makes her Mac'n'Cheese, and I tell him to cut the recipe into one-third of it's original quantity, and we still end up with leftovers. 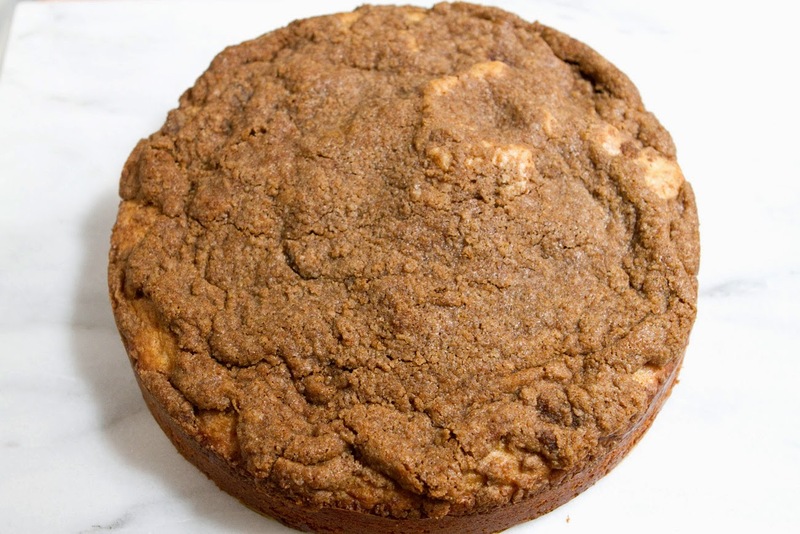 Consequently, I ended up with a big 10" coffee cake and a few muffins made of leftover batter! Luckily, the cake is delicious. 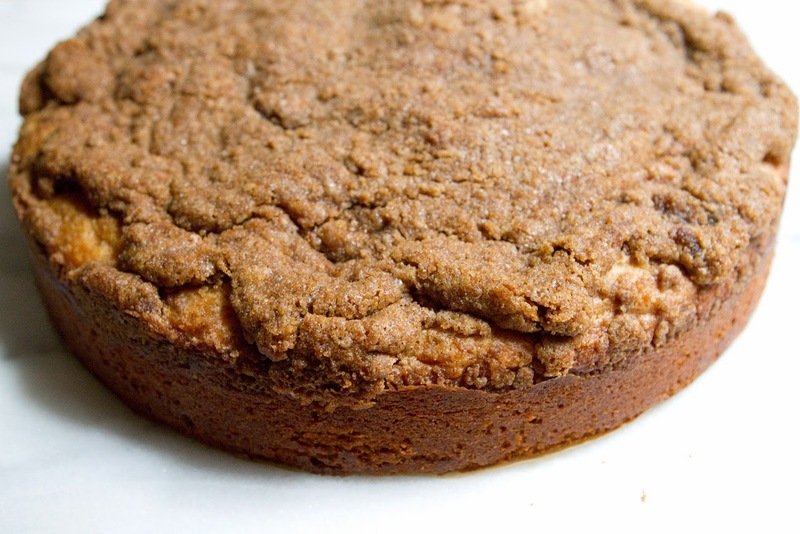 I know most coffee cake is delicious, but this stuff is a step above any coffee cake I've ever tried. 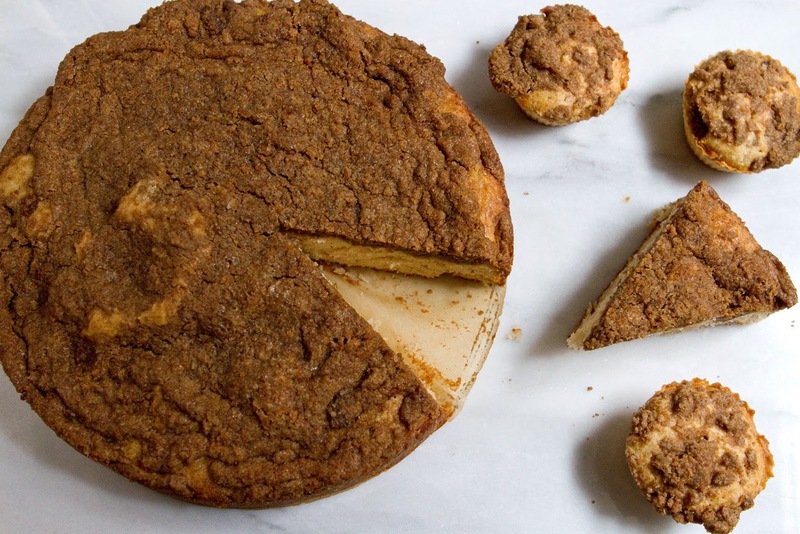 The cardamom streusel is really out of this world. I mixed a bit of cinnamon into the butter with the cardamom so there would be familiar notes in the streusel, but the major flavor is definitely the cardamom, which makes a brilliant, sweet, spiced, complex streusel. On the first day, when it cools, it's crispy crunchy, but by the second day it's softened up a bit from all the butter it's soaked in, and then it's really magical. The cake has a magnificent texture. Not too dense or too airy, it holds together well but isn't thick or hearty. It's distinctively light and almost melts in you mouth- that's the 3 sticks of butter in action. 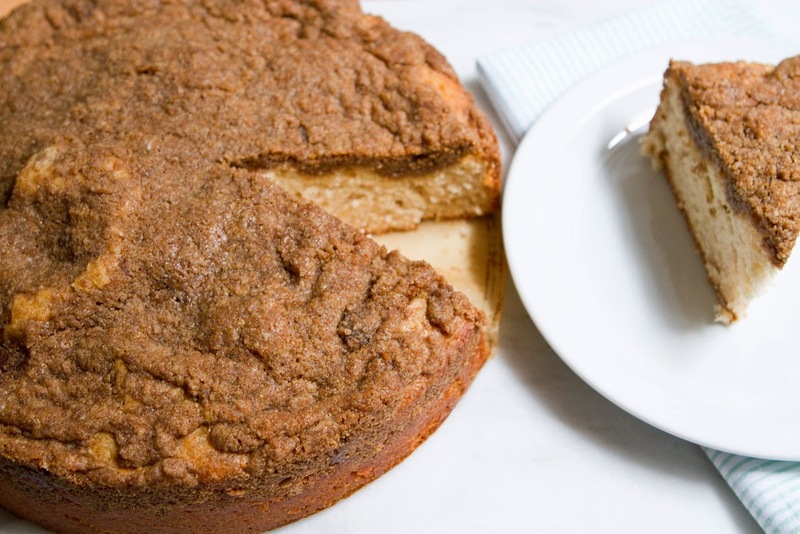 The cinnamon and cardamom give the cake nice lightly spiced taste, so even a bite without streusel still tastes lightly of cardamom. We ate it for breakfast, and dessert, and occasionally a snack, for about 4 days before we finished it off last night. When I told S we were eating the last slices, he was disappointed. I told him not to worry, I already want to make this cake again, but this time with blueberries and lemon in it! Or maybe apples! 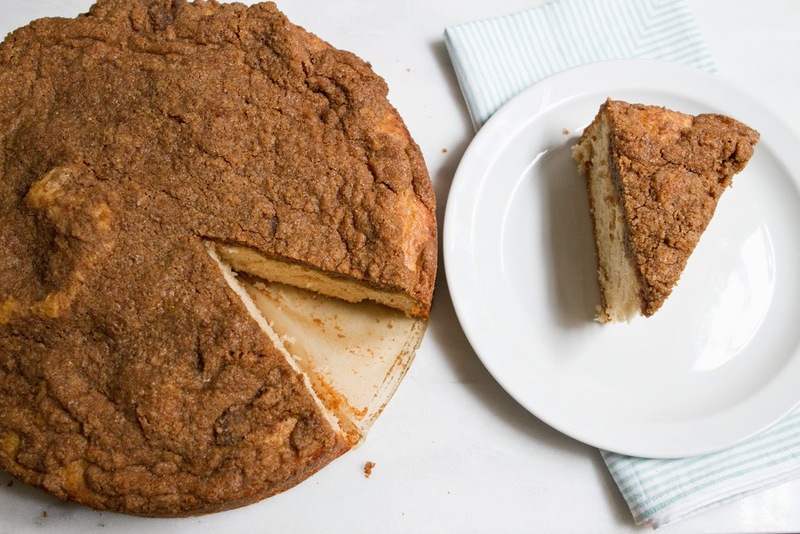 Let's make it with ginger streusel next time, I said, and put vanilla bean in the cake! The adaptations and changes you could make to this cake base are endless. Enjoy! In a medium sized bowl, beat the egg whites until stiff peaks form. Set aside. In another medium sized bowl, combine the flour, baking soda, cinnamon, cardamom, and salt. Whisk together. Set aside. In a large bowl cream together the sugar and butter. Alternating, add the milk and the dry ingredients in thirds while mixing. Mix until everything is well incorporated, but do not overmix. In a separate bowl, combine all streusel ingredients with a fork, pastry cutter, or your hands, until thoroughly combined. Pour batter into prepared pan, if batter rises above the halfway point, use the rest of the batter to make some tasty muffins* (directions below). Sprinkle half the streusel topping over the batter, and use a butter knife to lightly swirl it into the top of the batter. Sprinkle the rest of the streusel topping on top (reserve some for muffins, if making). Bake at 350F for 45-50 minutes, until a toothpick inserted into the middle comes out clean. Allow to cool atleast 6-7 minutes before removing from springform pan, or before serving from a 9x13 pan. If you have leftover batter, grease a muffin tin or line it with paper or silicone liners, and fill each cup just a bit over halfway. Sprinkle leftover streusel topping over the top. Bake at 350F for 20-25 minutes, or until a toothpick inserted into the middle comes out clean. This is in my Top 5 best ever things I have made. Instantly addicting. Per my own bad reading of the recipe, I added whole eggs and added them after the butter and sugar were mixed. Recipe is amazing like this.